Scott Fischer of Scott Fischer Enterprises sells Blue Ridge Harley-Davidson in Hickory, North Carolina to Josh Russom. This is Josh’s second Harley-Davidson dealership and second purchase from George Chaconas of Performance Brokerage Services. 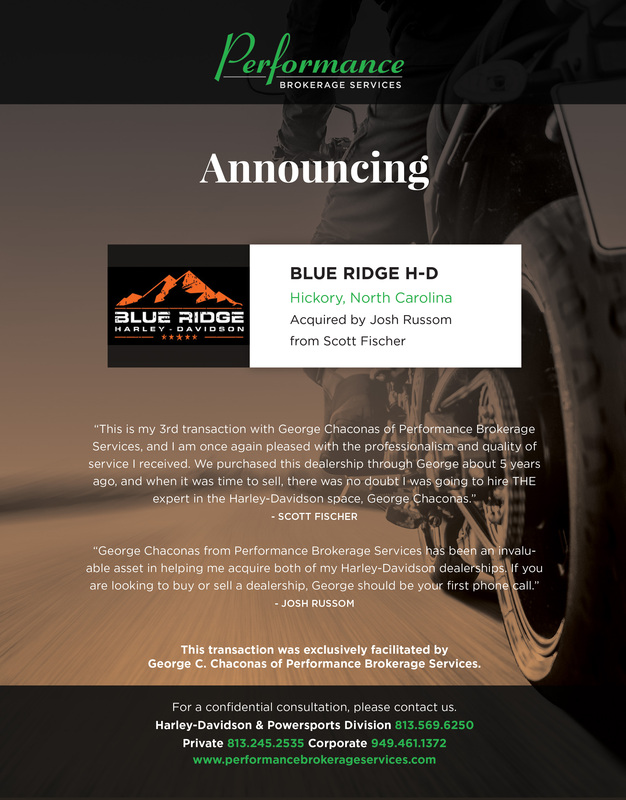 Motorsports of Hickory, LLC doing business as Blue Ridge Harley-Davidson in Hickory, North Carolina sold from Scott Fischer Enterprises to Josh Russom, owner of Redstone Harley-Davidson in Madison, Alabama. Josh Russom had reached out to George Chaconas of Performance Brokerage Services, an automotive and Harley-Davidson dealership brokerage firm, for assistance with purchasing his first Harley-Davidson dealership. In 2016, Josh’s dream came true when he acquired Redstone Harley-Davidson in Madison, Alabama through Performance Brokerage Services. Eager and anxious, Josh consummated the deal within 3 months. When Scott Fischer, owner of numerous Harley-Davidson dealerships, reached out to George Chaconas to sell Blue Ridge Harley-Davidson in November of 2016, there was significant interest by many parties. George and Josh Russom reconnected to discuss the dealership opportunity and see if Josh was ready for his second store. Quick to act again, Josh signed a Letter of Intent to Purchase within one month and the dealership transaction was closed two months later. Josh Russom, is now an owner of two Harley-Davidson dealerships with his partner, Andrew Campbell, who is based out of Milwaukee, Wisconsin. The new owners are two young college graduates, both married with young children. Josh enjoys all types of outdoor sports whether it’s on the water or on the road and of course is a Harley enthusiast. Josh is ready for another challenge with his purchase of Blue Ridge Harley-Davidson. Along with his business partner, Andrew Campbell, who has a degree in Supply Chain Operations Management and Marketing, as well as an MBA, the two are certainly up for that challenge. His history with Harley-Davidson and his education have led him to becoming a Harley-Davidson dealership owner. He also enjoys the outdoor life with his family. Scott Fischer purchased Blue Ridge Harley-Davidson in 2012 while celebrating his 25th anniversary with Harley-Davidson and as part of his new commitment to focus solely on selling Harley-Davidson motorcycles and owning Harley-Davidson dealerships only. He decided to sell Blue Ridge Harley-Davidson in Hickory, North Carolina in order to focus on his dealerships in Florida, New Mexico and California. Josh plans to keep the name Blue Ridge Harley-Davidson and the dealership will remain at its current location at 2002 13th Avenue Drive SE in Hickory, North Carolina.